During a wild dolphin swim week at wildquest.com, I found a lot of small and larger pieces of sea glass, mostly light green, pale blue and white, all along the beach on the ocean side of Bimini Island, in the Bahamas. None on the bay side. 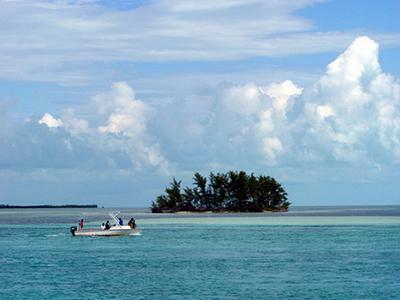 Bimini is a tiny, one-block wide island, only a few miles long, and is just west of Ft. Lauderdale, FL. There's also lots of broken pieces of black coral on the beaches. Nice seashells, too! A former pirate haven. No; unfortunately my digital camera's battery died, and could not be replaced in those tiny shops on Bimini. And...I didn't collect much of the sea glass then, just a piece or two of the prettiest. Next time I go to swim with the wild dolphins there, I'll definitely take pix & bring a lot home with me, maybe in November. The one thing I remember about Bimini when I visited about 15 years ago was all the glass on the beach on the Atlantic side. I figured a lot of that glass is well on its way to becoming nice pieces of sea glass. Do you have any photos?